So you pine all year, and then two come along at once! That’s right, I am now the proud owner of not one but two spinning wheels! They are both Ashfords, both about the same age and both sitting in my house. I could barely contain my excitement. Not least as collecting them had involved road trips to Scarborough and York. 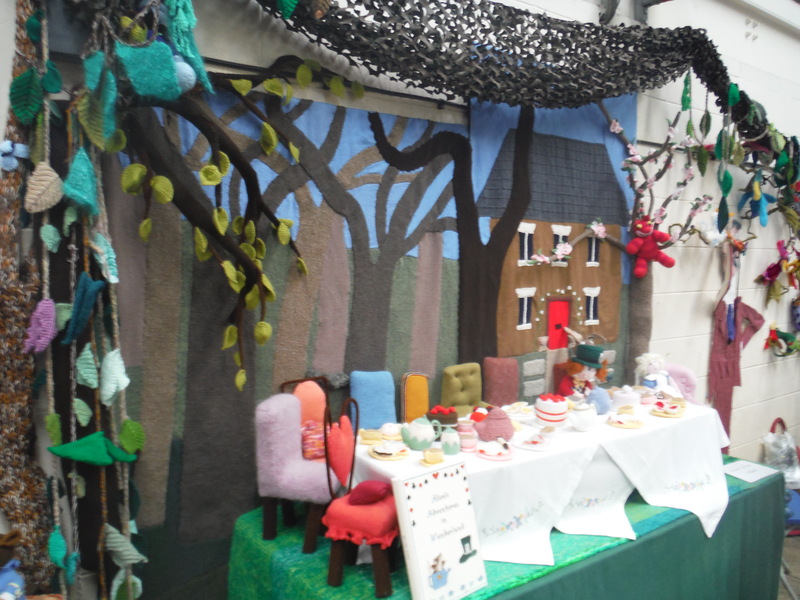 They have obviously been well loved – and Mavis even showed us some of the things that she had made with hers – including a cardigan with beautiful colours in it – all dyed from plants. I think I am some way off that for the moment! 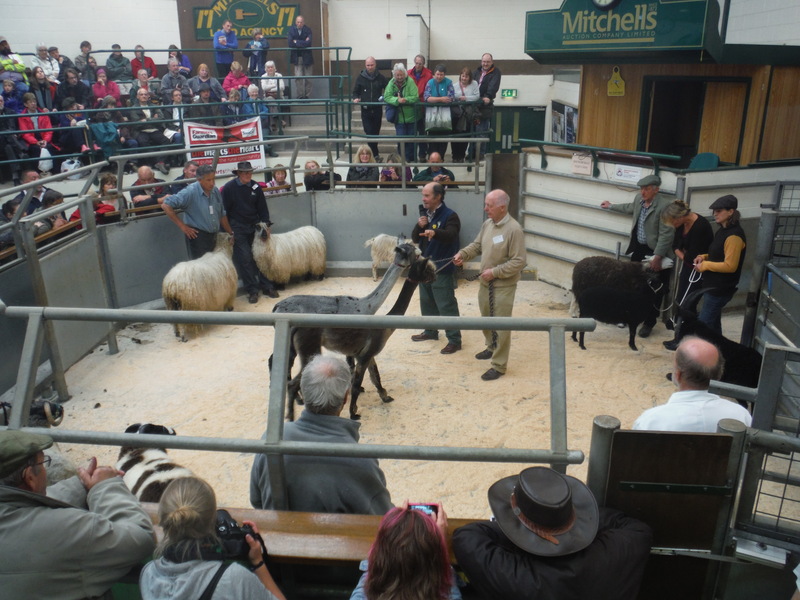 The second wheel was a real surprise – it came with some extras – a Carding Drum which lets you comb out fleece ready for spinning, but that actually looks like a Spanish inquisition type torture device and a couple of extra boxes. When I was introduced to this box I was told there was some fleece in there. When we went to collect, a couple of boxes had turned into 5. And when I got home and looked inside the first box…. 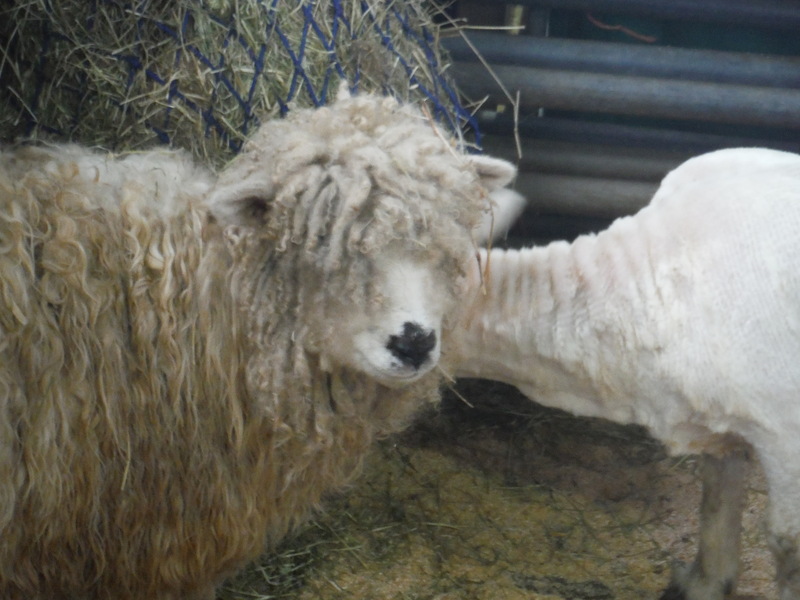 There were two actual sheep fleeces in it. 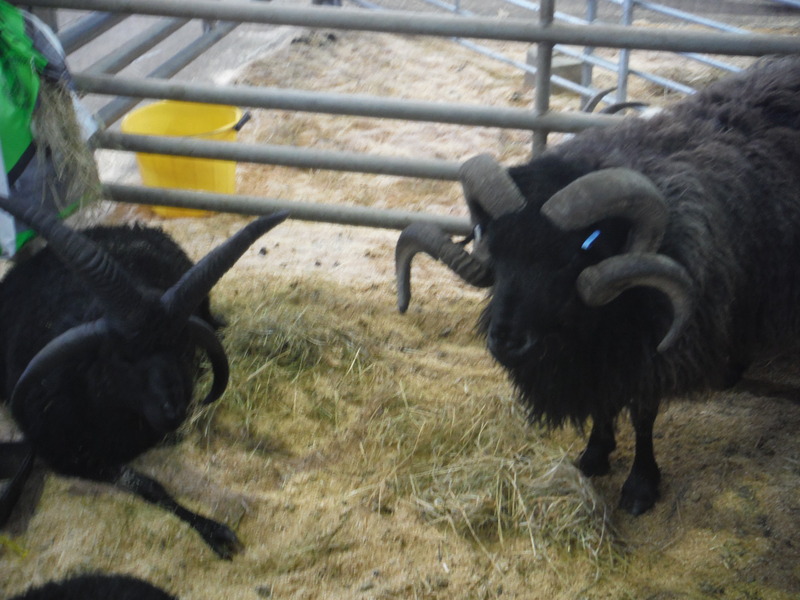 Complete with straw and sheepy smell. I don’t know that I have ever been more stunned. I just looked at them. 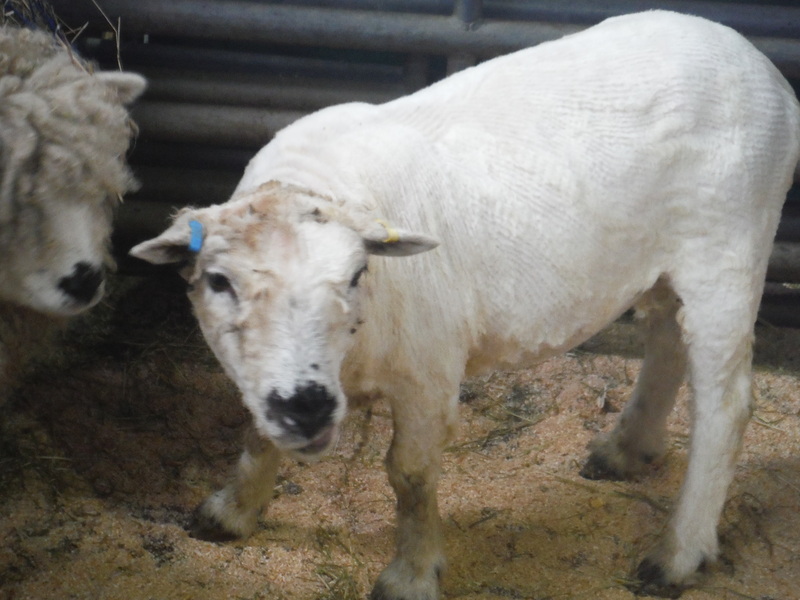 So on rough calculations I have around ten fleeces from ten actual sheep. It’s a flock of my very own. I have absolutely no idea what to do about this, so at the moment they are sitting in the spare room being interestingly sniffed by the dog who has finally found a sheep she can get up close and personal with. I’m just hoping the sheep don’t want them back. So I am super loving it. But I need to put them away as we are in the middle of a decorating nightmare – so over Christmas I am going to have lots to play with once we are finished. I love Christmas. I’m going to decorate the pasting table. 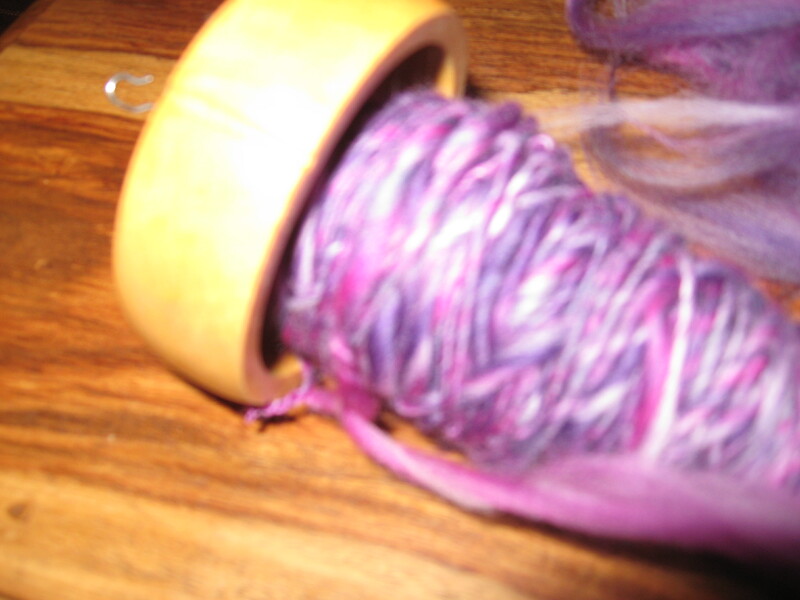 Inspired to dash on, I then got straight back on with the spinning! I was a little bit quicker this time and a little more careful. 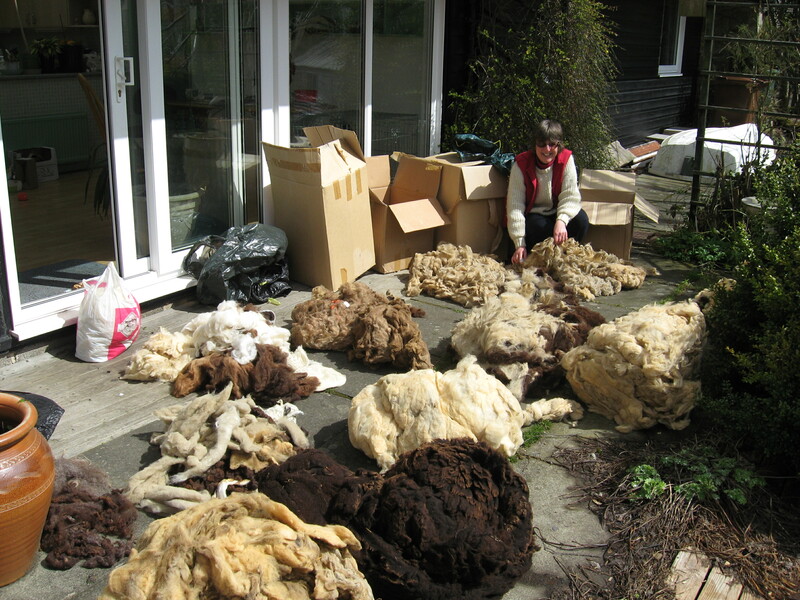 If I got a big blobby bit of wool then I would go back, tease it apart and re-spin it all tidily. I was quite chuffed with my attention to detail. 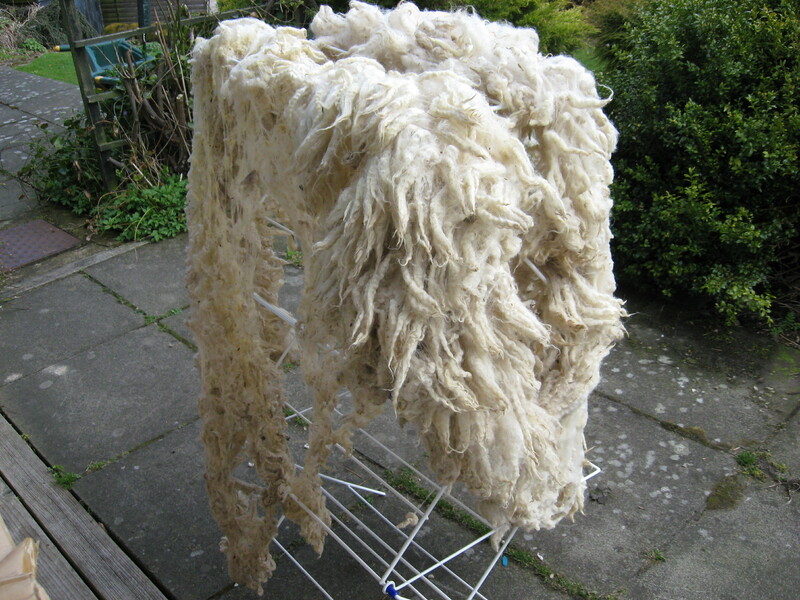 I seem to have got through a lot of fluff very quickly with this project – I guess because I am making quite thick wool due to inexperience. 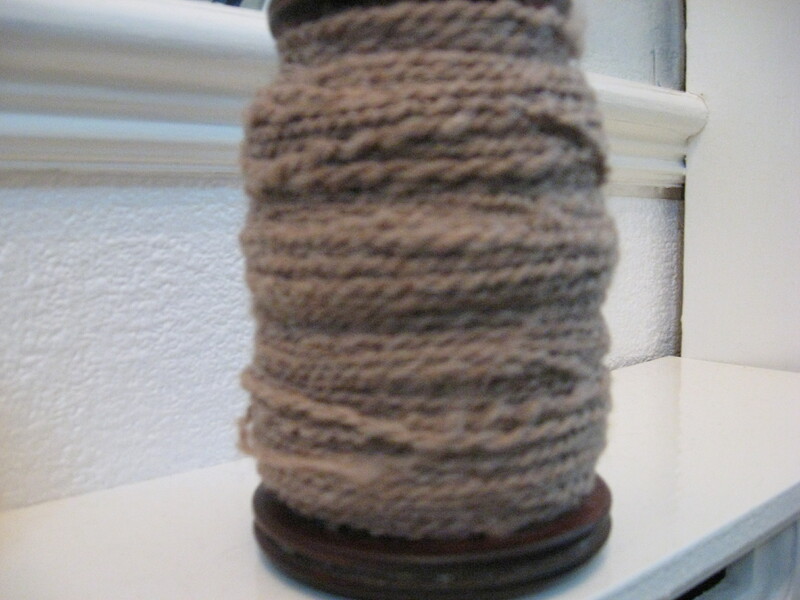 I also think that there must be something that you need to do to make thinner wool – if I let the thread get too thin then the weight of the spindle (and the already spun wool) makes it snap. So I think I have a chunky wool spindle. 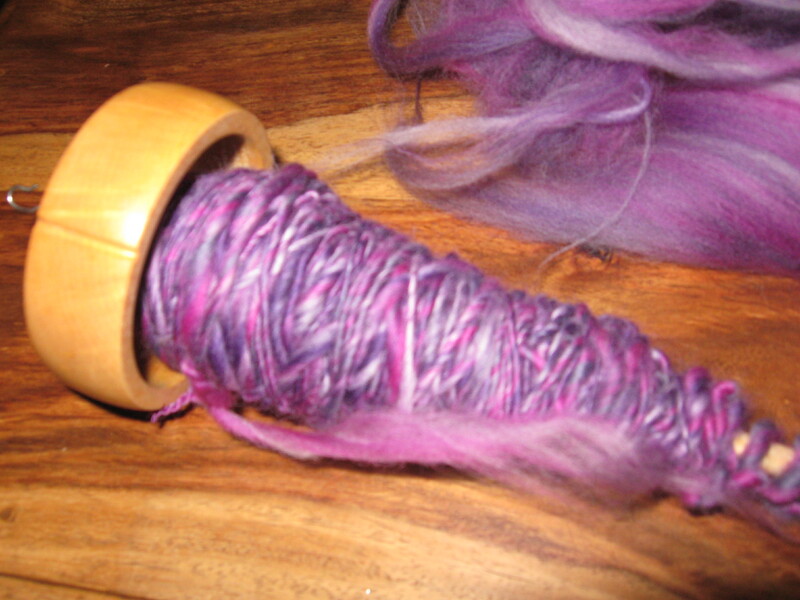 It took me another three days to repeat the process, but my spinning was definitely better – more even and finer looking. I don’t know if you can see it on the photos. 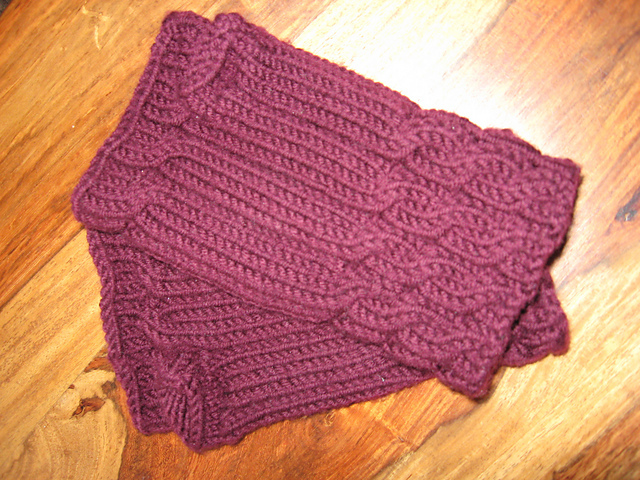 And two hours later I had finished the knitting. There are lots of bonus’s here. 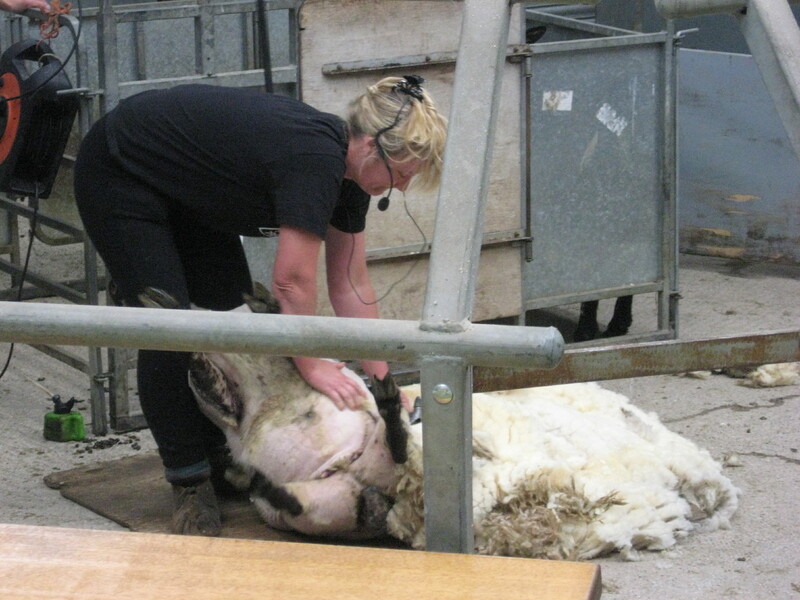 For six days making wool I reckon I got three hours knitting (if that). Based on this calculation I am never going to be able to keep up with enough spinning to fulfil the knitting side of things. 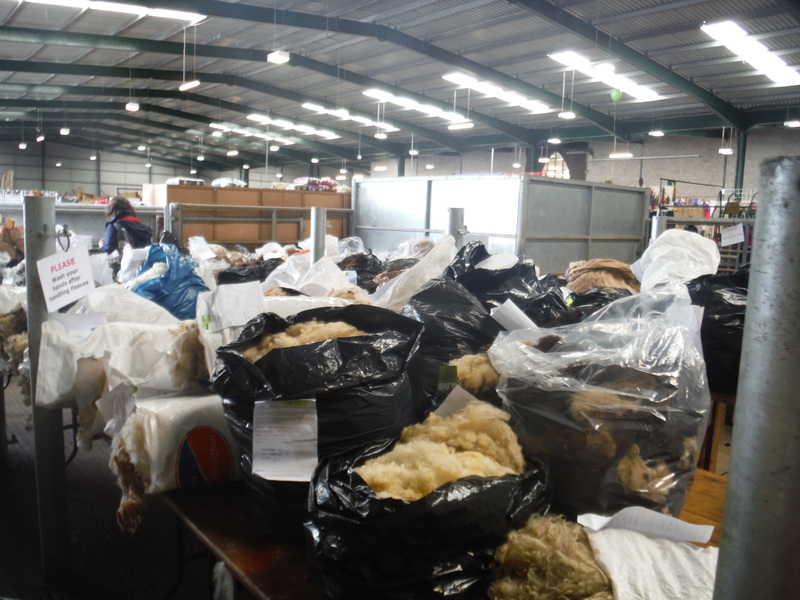 Therefore I am still going to have to buy wool too – yay! So what does my finished item look like? 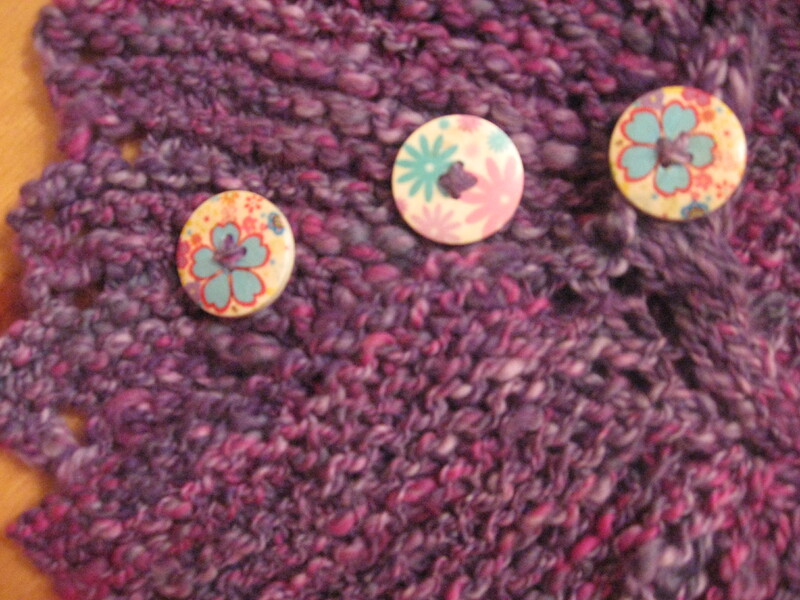 I added extra buttons because they are super lovely buttons… and I put the first one in the wrong place. It’s a lovely pattern, and I definitely think it suits the homespun nature of this wool – it’s also really easy to knit – I am contemplating dashing out 27,000 of them for Christmas presents. Pattern is HERE. So this only leaves me with one problem. 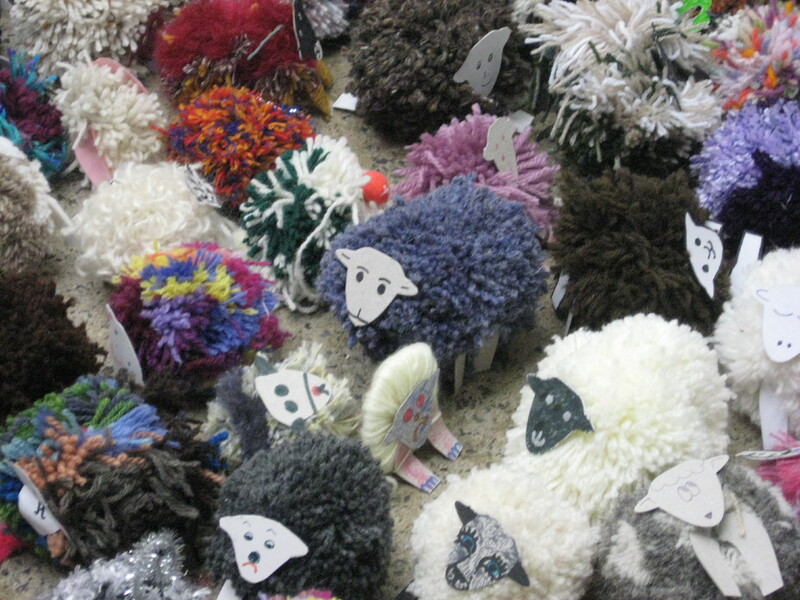 The wool looks different! The first lot is less ‘spun’ than the first lot, and the second lot is definitely got more definition about it – I suspect I would have got different wpi if I had actually checked (of course I didn’t check – who do you think I am!). So the knitting to the left is more fluffy than the knitting to the right, right? So I am now doing that thing where people compliment me on it and I say – ‘oh thank you! 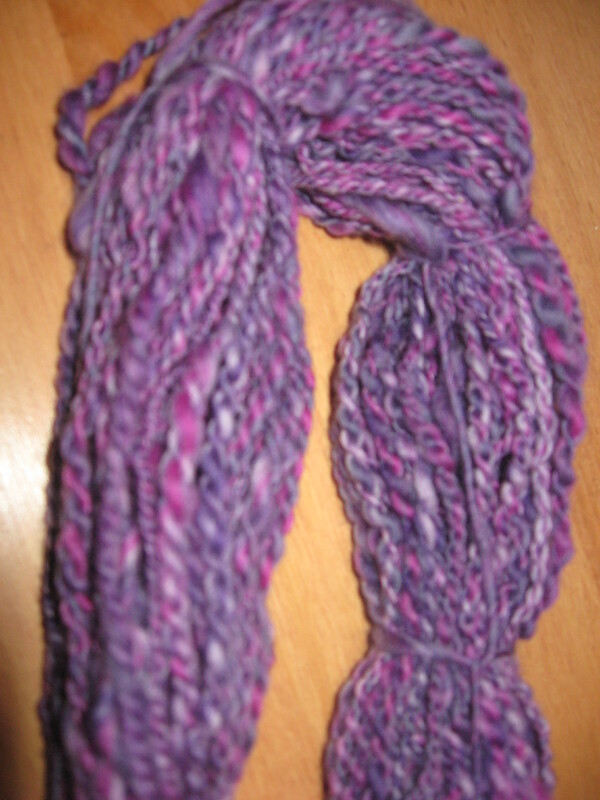 I spun the wool myself! But what you can see is that I did it in two lots and I think I got better as I went on and if you look where these two ends overlap you can really see that there is a big difference in the wool I ended up with so it doesn’t quite match….’. Please shoot me. And pass me some more fluff – it won’t spin itself you know. 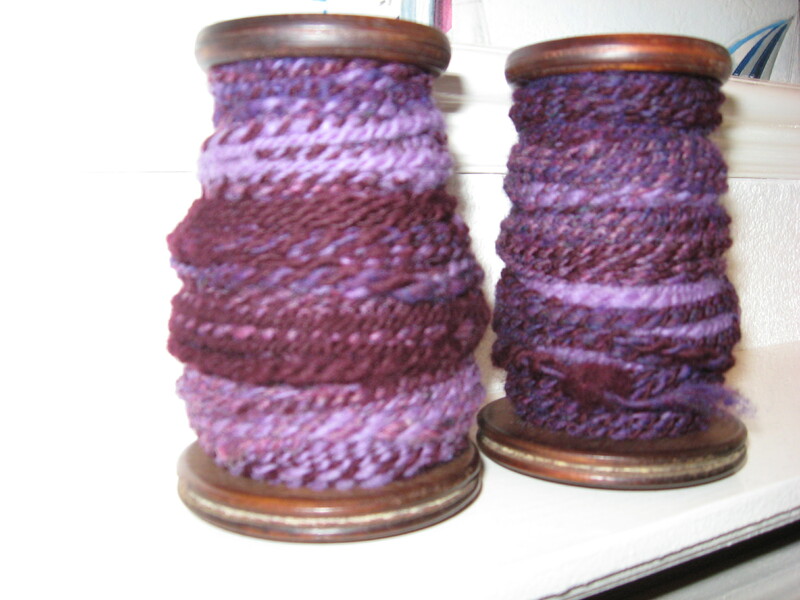 I have spent all week spinning. My results have been a little mixed – there is not a consistent thickness to what I am producing, but I am very excited. The soundtrack to my spinning goes ‘concentrate, concentrate, no, don’t do that, DON’T… Thunk… Damn’. Sometimes I say even ruder words. The difficulty with drop spindling is that it’s like trying to rub your tummy and pat your head a the same time. To produce good wool you really need to have a consistent speed on the spindle and ensure its always going in the one direction. 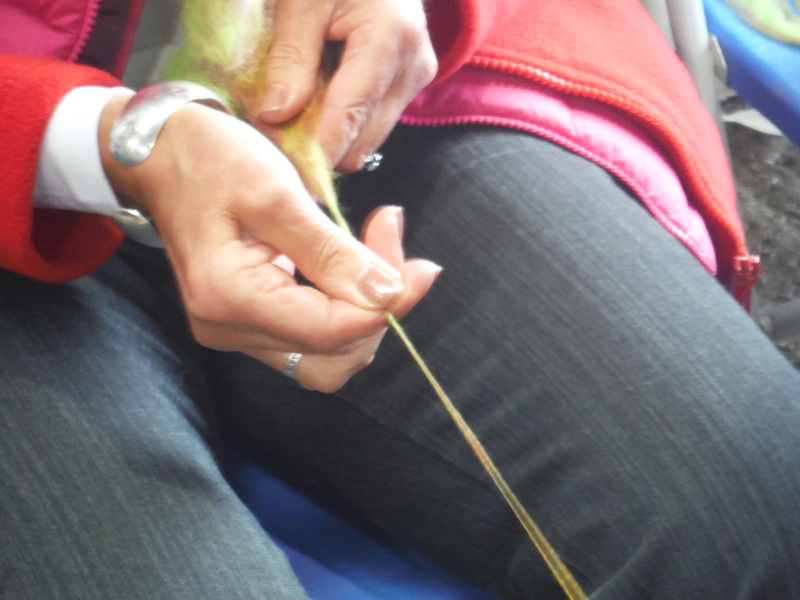 Having hung the spindle from your fluff, set your spindle spinning you then need to use both hands to ‘draft’ (get me – that’s a technical term) the fibre into a piece thin enough to allow down onto the twisting ‘wool’ so it gets twisted and turns into wool as well. So the twist runs up the fibre twisting it tight. The problem is while you’re concentrating in your hands, your spindle has slowed, stopped spinning and is now starting to spin in the opposite direction, turning the wool back into fibre at which point it all falls apart, drops to the ground and rolls under the sofa , liberally applying purple fluff all over your carpet (and picking up an equal amount of dog hair and differently coloured fluff from the regularly hoovered floor). Progress is not exactly fast. 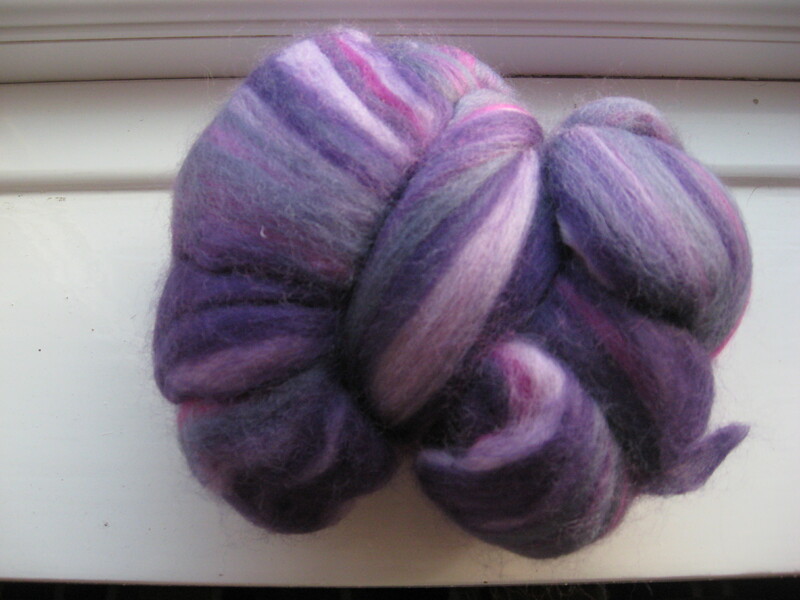 And there are lots of lumps from when you get distracted in re spinning the spindle and let too much fibre through. Apparently the lumps make it more attractive and unique. 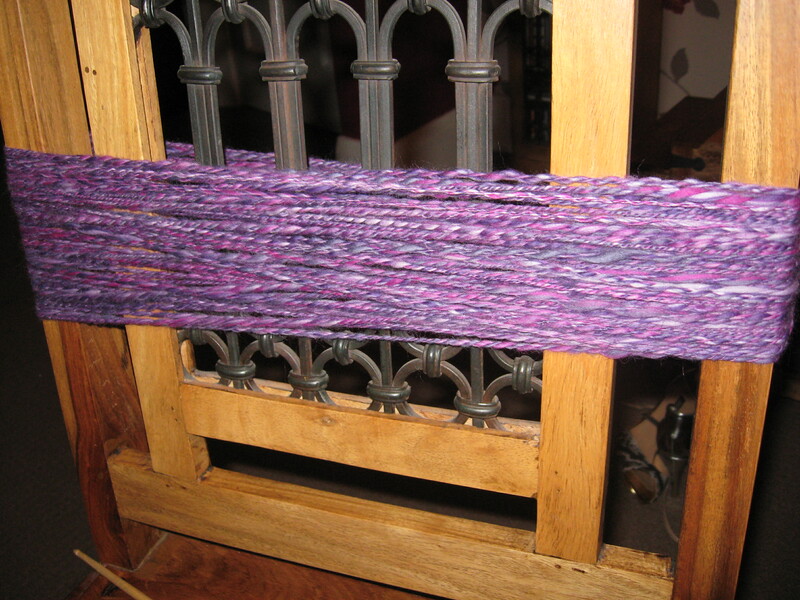 This involved hooking them both onto the spindle and trying to hold onto them while dropping both threads onto the spindle while spinning it in the opposite direction, so they are twisted together. 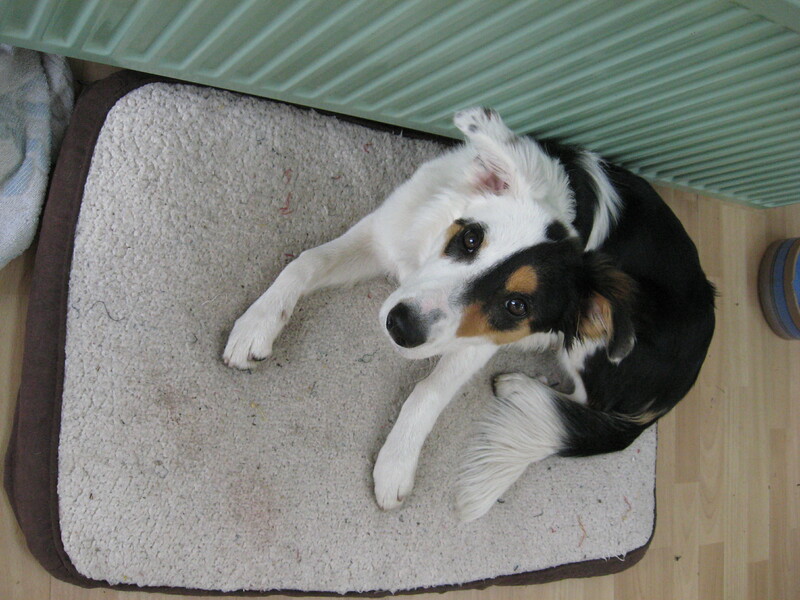 Well that was never going to work – within seconds one had escaped and was running loose all over the floor – much to the dogs delight. 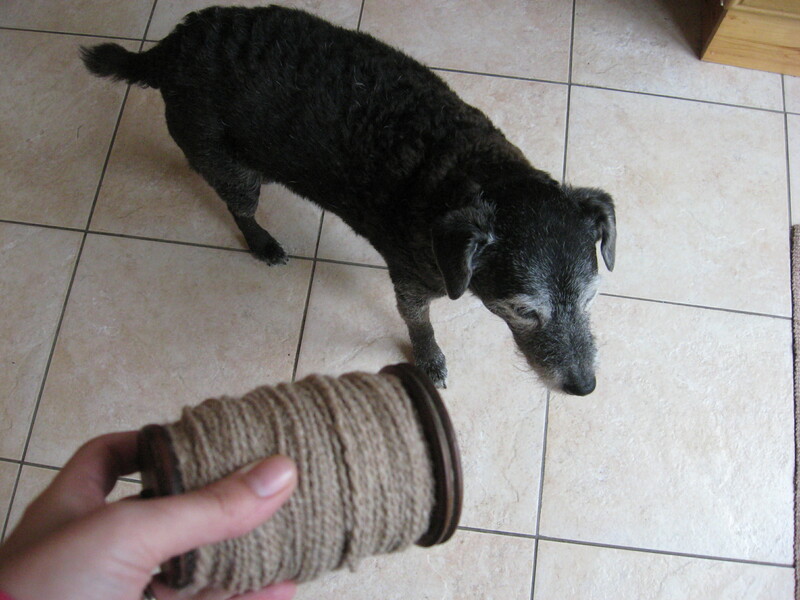 So having twisted the threads together, it only took another day to get it skeined round the back of a chair. I ended up with this. 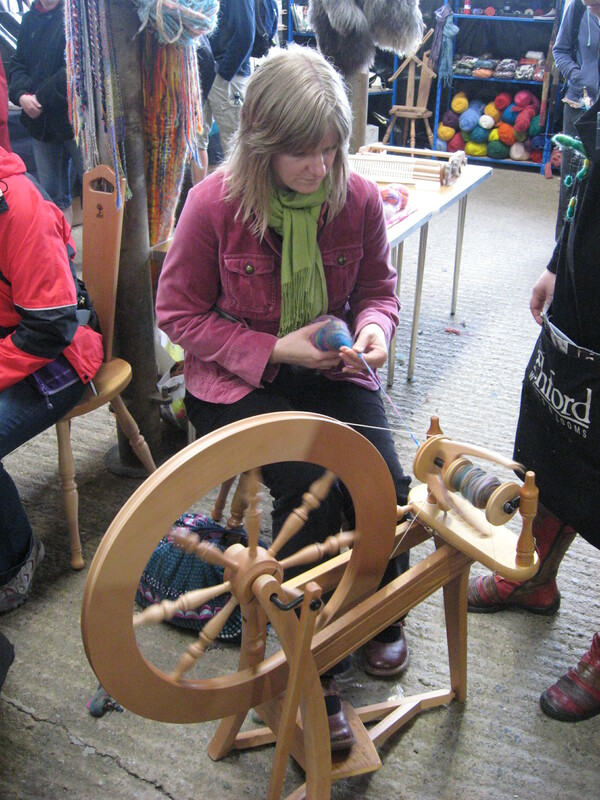 I counted how many times I wrapped it round so I could work out how much wool I had – it’s a hot tip from my spinning friend! I had 56 meters here. 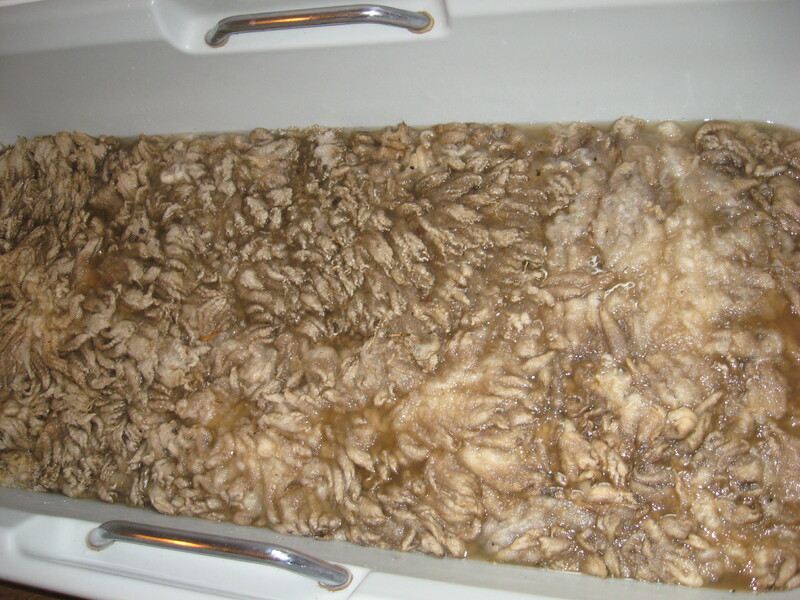 It actually looks like wool! 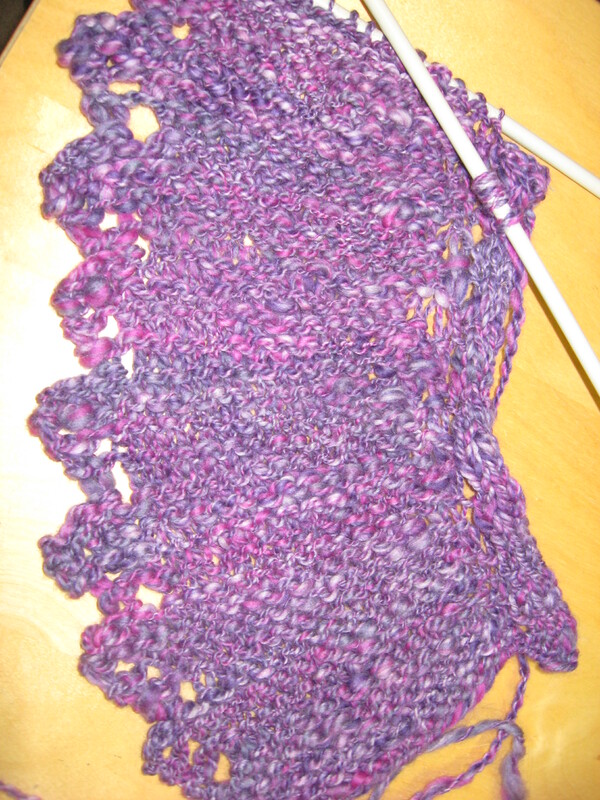 You can see the thick and thin and lumpy bits, but it looks more cute than when it was just one strand. I was so excited. 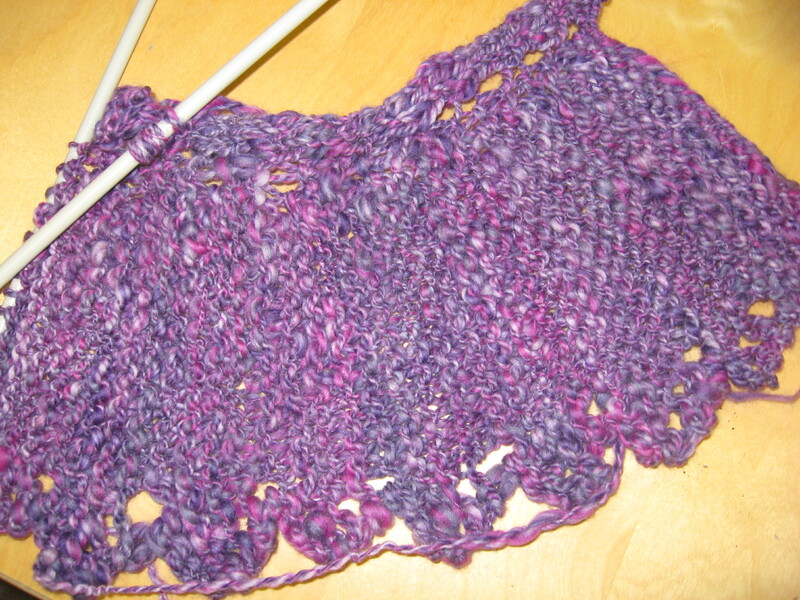 I wanted to knit it straight away. 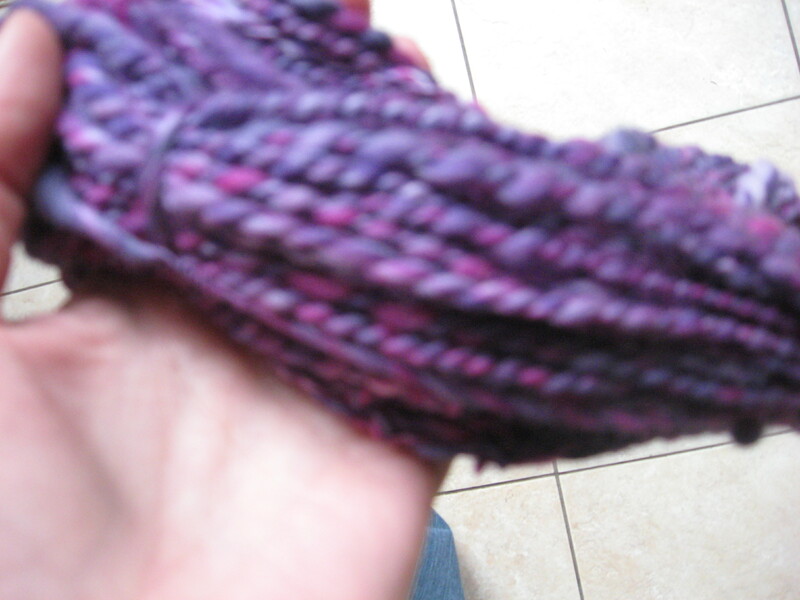 But there was still one more step – get it wet to set the twist (so it doesn’t unravel when you start to knit it) and then dry it. So far this has taken about six days. It finally looked like this. 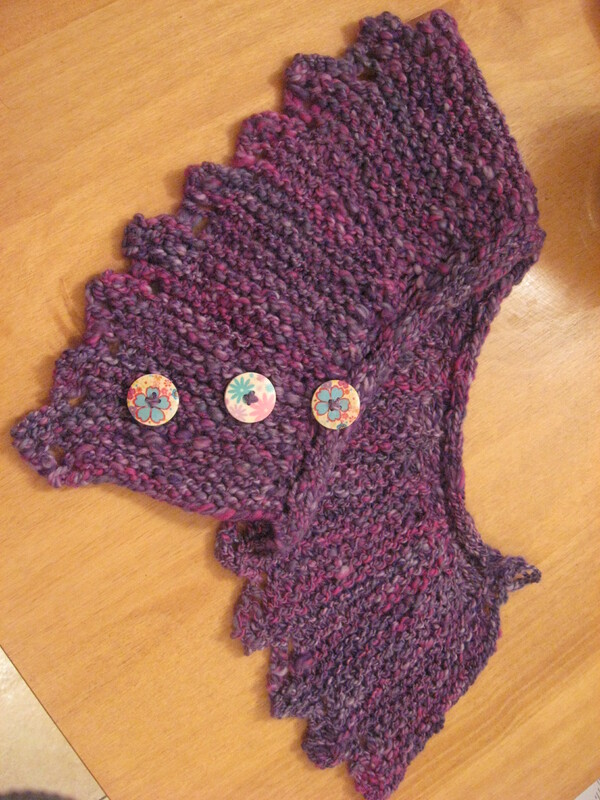 In an hour and a half I had knit it up into this. It is the most gorgeous, soft, beautiful thing because of the work that has gone into it. I am totally proud. I am a bit worried that if I am going to do much of this it’s going to take six days to keep me knitting for an hour and a half. It’s never going to work. I am a firm believe in life having a way of working out – and this last week has just reinforced that. Somehow the right people and places will appear in your life at just the right time to help you along the way. When I started sailing it was because my hubby and I had a random conversation and decided it was something we would really like to have a go at. But having visited a few sailing clubs we didn’t really feel like we fitted in anywhere. Over a few drinks with friends we discussed this, and identified two other couples who would be keen to start as well. So without much of a plan we now had a group of us. Because of this we could then afford to buy a boat. So we started looking at boats instead of sailing clubs – figuring that one would naturally follow the other. The boat we eventually went to look at was at a fairly remote club – but that was OK – our intention was to see if it was alright, buy it, bring it home and sort it from there – it wasn’t as if we would need to go back to the club, one of the closer ones would work out sooner or later. Once we got there however that all changed. We were immediately approached by members keen to say hello, cups of tea and general chat was provided along with some tyre kicking on the boat (turns out we should have spent more time on the boat, but at the time we understood more about tyres). By the time we left that day we had bought a boat (an Enterprise. Hot tip DON’T buy an Ent as your first boat. Especially not a wooden one. There’s a reason there are so many for sale so cheaply), joined the club, got on a waiting list for training and had already capsized the boat once. My husband is now the commodore and we are firmly committed to this remote club up in the wilds of Northumberland. 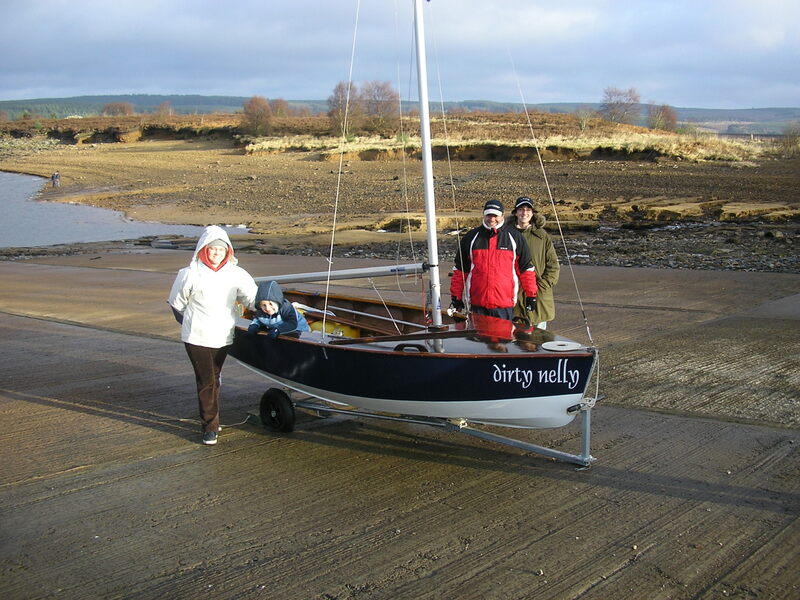 The Dirty Nelly – post re-furb! When I moved company some years back I was fairly apprehensive – I had been with the previous company for nearly ten years, so leaving felt like a huge leap of faith. But on starting my new job I found a welcoming environment and a friend. It turned out this friend knitted. It all started with a pair of fingerless mittens (Fetching – I think everyone in the world knit them) that she wore throughout the winter. 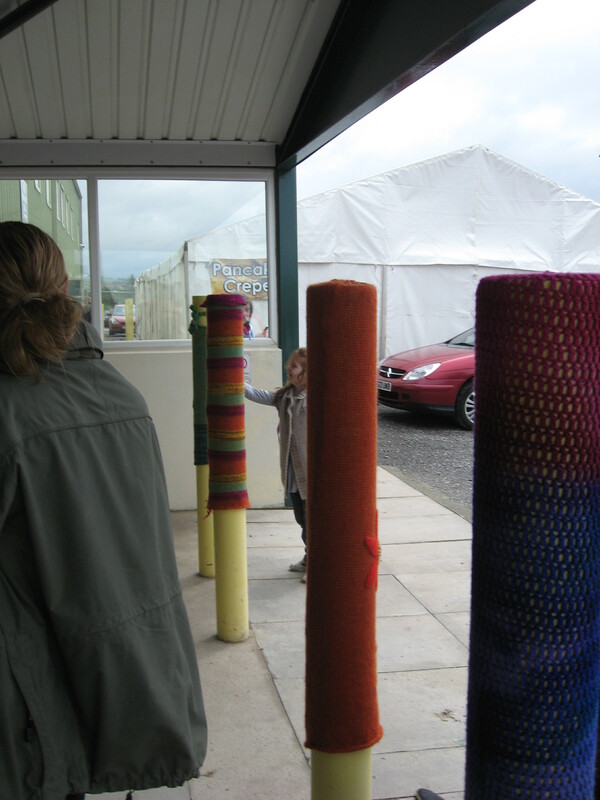 And when I admired them for the 47th time she suggested I knit some – remember this is an experienced knitter and was never going to fall into the trap of knitting some FOR me – oh no, knitting my own had to be the answer. So I bought some needles and wool and after a few lunchtimes of wondering how you were meant to knit with five needles in a circle, I had knitted nine of them. This might seem an odd number, but it took me this many to get two roughly the same size. Knitting is now really important to me and although I go through fits and starts, I have made new friends and created beautiful things by persevering… but I needed that help to get me started. Which brings me to Spinning. Spinning and I weren’t getting on. I was kind of managing. I knew that I had to set myself a goal or else I was not going to keep going for long enough to get any level of proficiency. But it was all feeling a little like hard work. Until i popped into the Knit Studio. As my favourite yarn shop it’s always a treat – but it was also a surprise to find everyone there spinning with a drop spindle! This had never happened before – mostly you find people knitting or browsing – but I had never been there when spinning was going on. 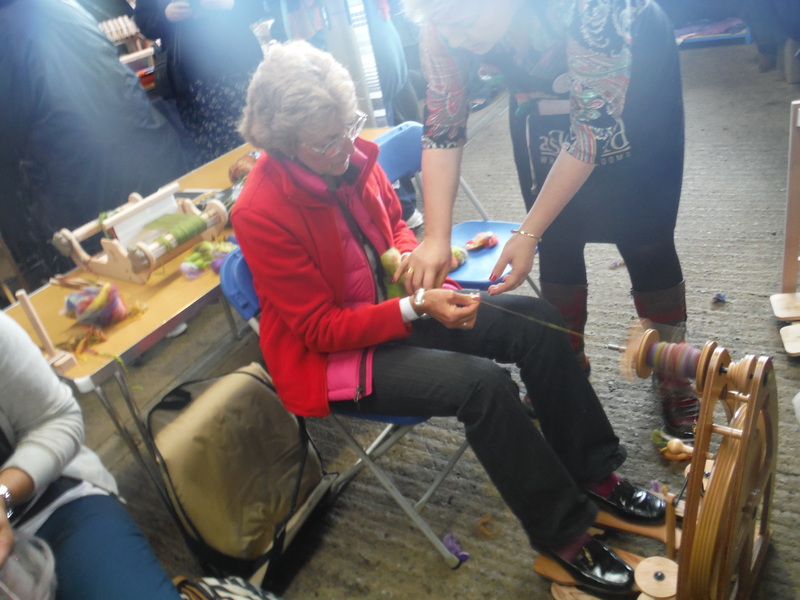 In a further stroke of luck – I had my spinning with me! What followed was 45 minutes of intense teaching and coaching from a new friend. No wonder I was struggling – I hadn’t understood enough of the basics to make a go of it – I was working against the fibre rather than with it. By the end of my lunch hour I felt like I had made a bit of progress, and over the weekend I have been spinning my heart out. In fact it looks a bit like this. So it turns out that if you smile, are pleasant and just ask, it’s amazing how you can find the help you need – and make a friend or two along the way. I haven’t posted for a while because its coming up to end of quarter. Those in sales will now nod understandingly and offer me a gin. For those not in sales what this essentially means is that my time is currently spent peering at reports and hitting buttons on my calculator while scratching my head and wondering how on earth I am going to make 2 plus 2 equal 5. Maths was never my strong point – strangely not many children have ambitions to be a sales manager – most want to be an astronaught, train driver or doctor. In my case I wanted to be Indiana Jones – somehow I never saw being chased by nazis and wearing a hat as being dependent on my maths skills. So I wasted my youth digging holes in the ground in the rain with people with suspect dress sense and a penchant for facial jewellery. To be fair – it was probably more fun than maths would have been. 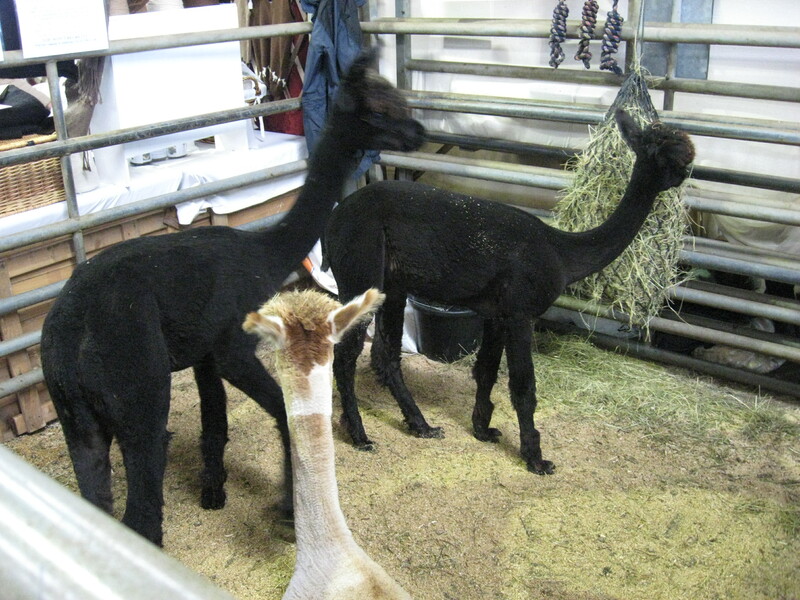 So I am posting today to tell you all about how I am going to chase my end of quarter stress away…. 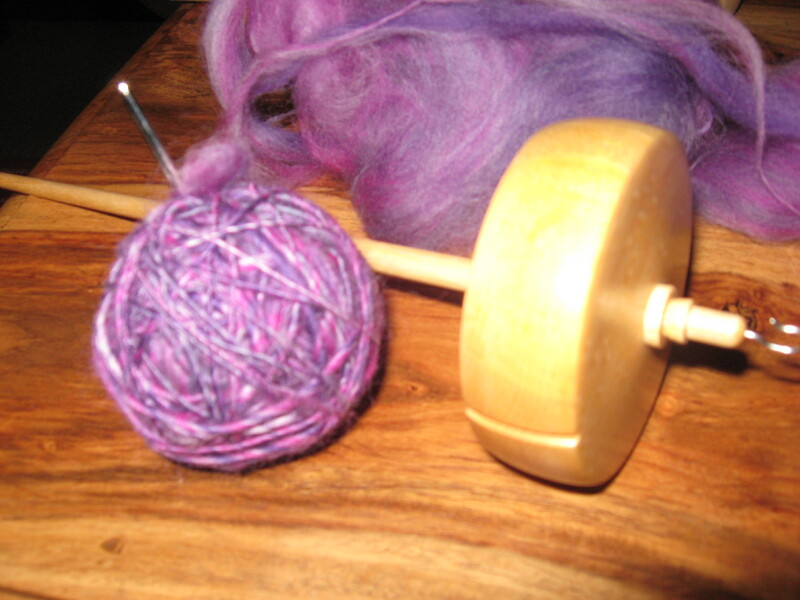 By doing some spinning and then some knitting of the stuff I have done the spinning of! What could be more fun??? Doesn’t it look pretty? I got it at woolfest and have been sitting looking at it ever since. 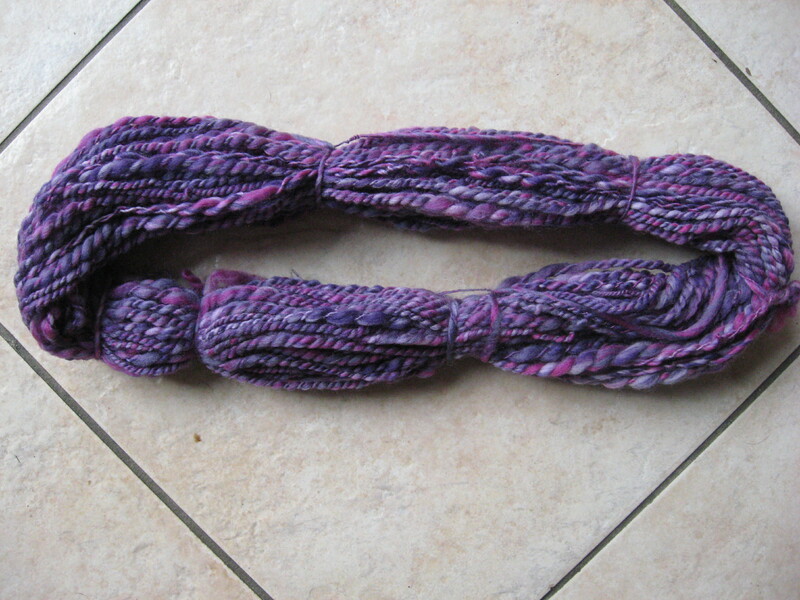 It’s merino and from a purple stripy sheep and I am going to use my drop spindle on it. 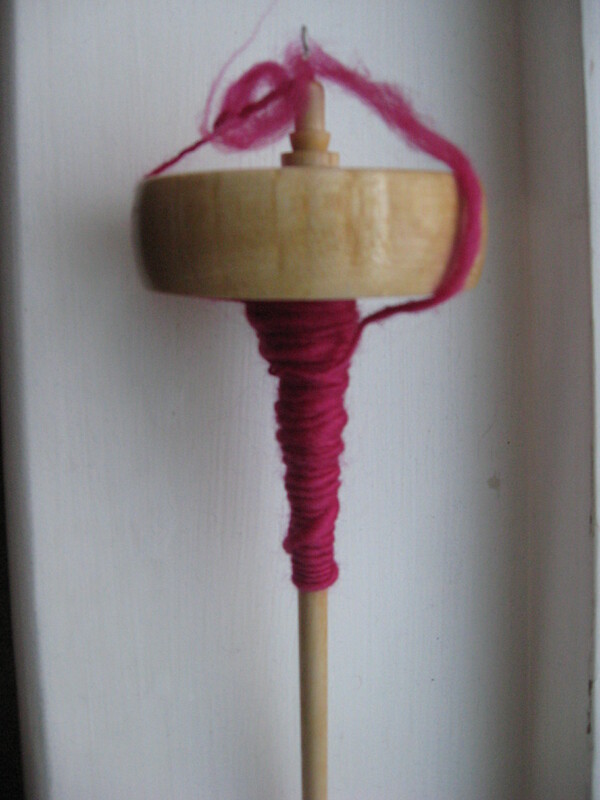 This is a drop spindle. 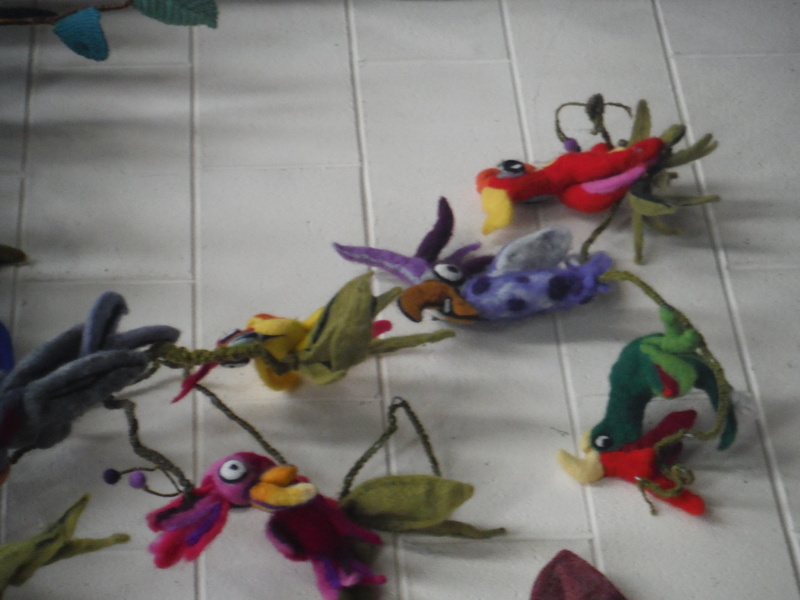 The idea is you hook the woolly stuff on and then spin it and it twists the woolly stuff to start to make it into a strand of twisty wool stuff. Once you have this you the twist two bits if the woolly strands together and then get it wet and dry and and -ta-dah- designer wool!!! 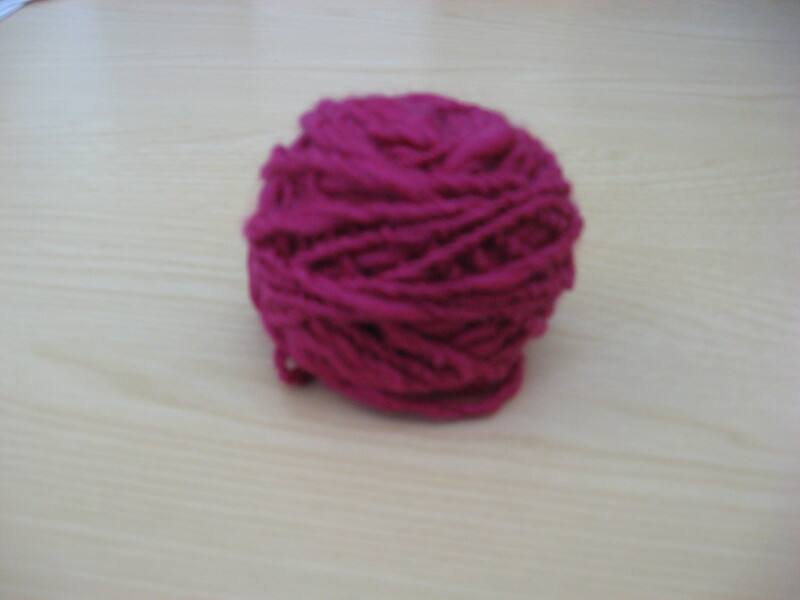 Bearing in mind the ‘finished’ roundabout yarn (some of which you can still see on the spindle!) 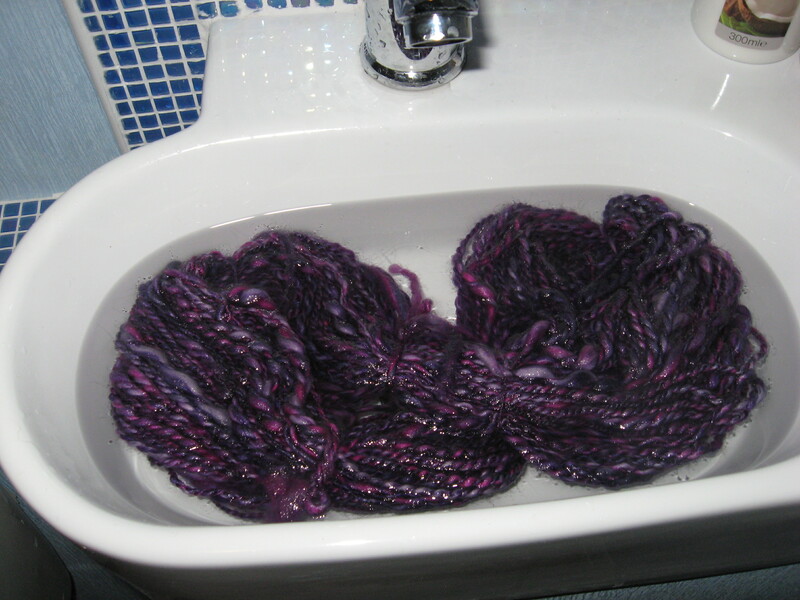 I last spun was an unmitigated disaster and is sitting in a sad little heap all on its own I think this is a bit of a challenge. 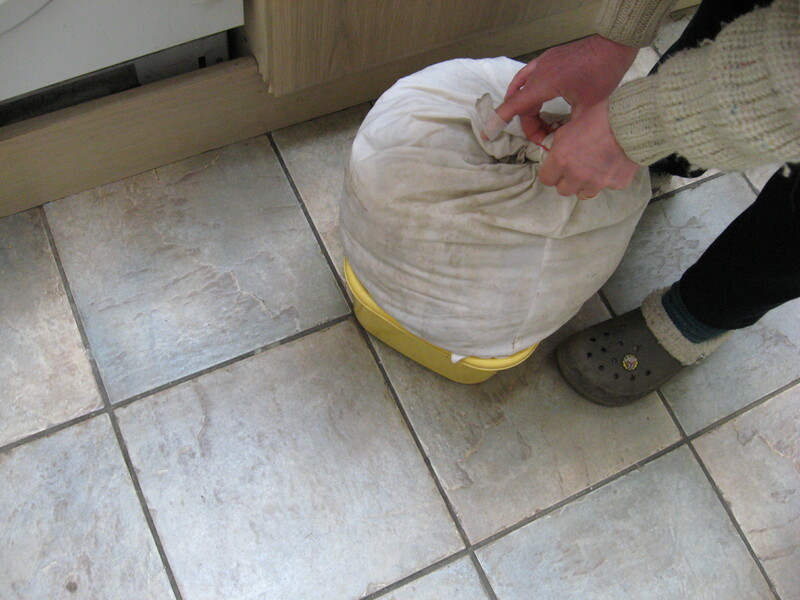 Apparently it doesn’t matter if your wool is lumpy, you can make it all lovely by knitting it into this. Well, it works in MY head….